Now This Is A Good Looking Coffee Brewer | OhGizmo! Once upon a time, we used to cover gorgeous home appliances and furniture. Lately, we’ve drifted away from that stuff, but coming across the Iikone Coffee Brewer makes us want to start again. If you’re going to make coffee in the morning, why not make it in what’s possibly the nicest looking brewer on the market? It’s expensive, and the company tries to make it sound like there’s some added function to justify the price. The IIKONE mk1 is the very first pourover coffee brewer with a totally unobstructed filter. This solution allows a brewing process undisturbed by uneven surface tension where the filter touches its support, and makes a proper use of the entire filtering surface. 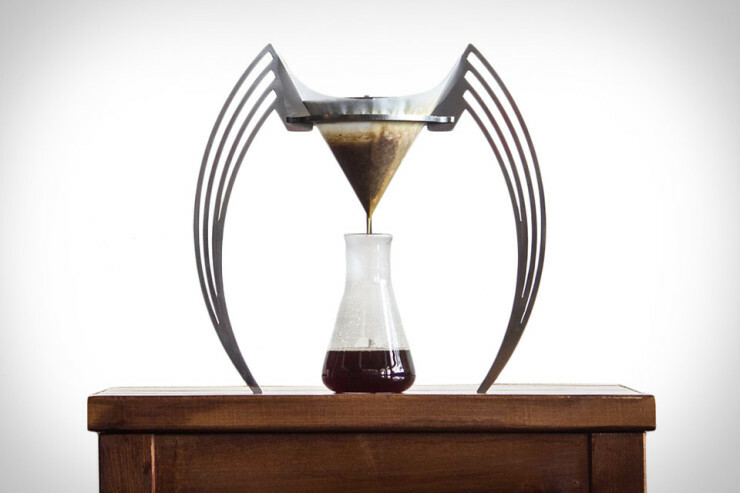 The ultimate result is a more complex, even less bitter brew than is the one produced by classic manual pourover brewers, and fewer nonsoluble particles in the cup. Right. So it makes better coffee? We’re not sure you’ll care when you’re being asked to pony up $700 for it, but hey, yeah, better coffee… why not? It’s made from “high gloss medical-grade stainless steel, CNC cut, machined and polished. It is compatible with popular 6-10 cup round or rectangular filters and conical metal filters.” And again, it costs $700. That’s the one Batman uses. It’s got to be good.